Forming Technologies Inc. (FTI), Burlington, Ontario, Canada, has released FormingSuite Sculptured Die Face (SDF) to address the needs of cost estimation, process planning and metalforming simulation. The software provides a free-form approach to creating and morphing addendum geometry, resulting in a fast, flexible and visual approach to die-face design. Providing the necessary geometry to run accurate virtual die tryouts. Designers can develop full draw developments, die faces and first-form geometry in minutes without the limitations of section lines and the difficulties associated with creating complex transition geometry in CAD systems. Fully interactive editing tools enable users to adjust and refine addendum geometry with ease, taking the user from concept to complete draw development in seconds. 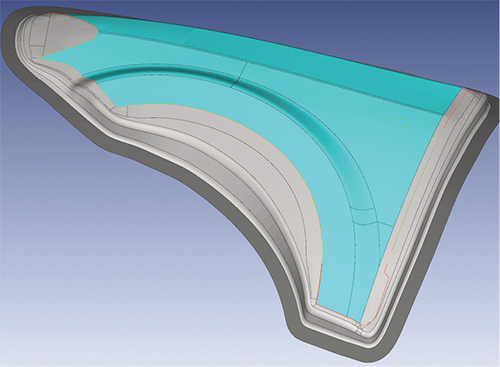 SDF greatly simplifies the work involved in positioning and attaching double- and multi-attached parts, creating, editing and evaluating fully developable curved binder geometry, controlling the depth of draw, defining addendum shape, and creating fully surfaced draw developments.